In an age of impending extinctions, a new tarsier has been discovered in the Philippines, thanks to Dartmouth researchers and their colleagues. Tarsiers are important in part because they shed light onto the origins of higher primates, the lineage that gave rise to humans. These simplest of primates exist only on islands in Southeast Asia, where the rate of habitat destruction is among the highest in the world. In the Philippines, the tiny animal with big eyes and ears constitutes a flagship species that serves to promote environmental awareness and ecotourism, much as the Koalas do in Australia. A desire to protect this important zoological and economic resource motivated a comprehensive genetic study of tarsiers conducted across the Philippine archipelago by an international collaboration of scientists. For the first time, DNA was used to identify and classify the tarsier populations. Four tarsier lineages, including the newfound variety, were identified, based on genetic differences. 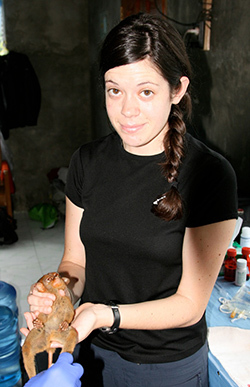 Gillian Moritz, a PhD student in Dartmouth's Ecology and Evolutionary Biology Graduate Program and in Dominy's lab, collected the genetic samples that led to the identification of the Dinagat tarsier. Dominy says that taxonomists—scientists who specialize in classification—had recognized three subspecies of Philippine tarsier in the past, but the new DNA-based subgroups are incongruous with these traditional groupings. The genetic analyses also showed that their geographic distribution differed from what had previously been thought. Adding the fourth type to the mix makes the results of the study all the more striking, because it "reveals an unexpected and unparalleled diversity of tarsiers," says Dominy. 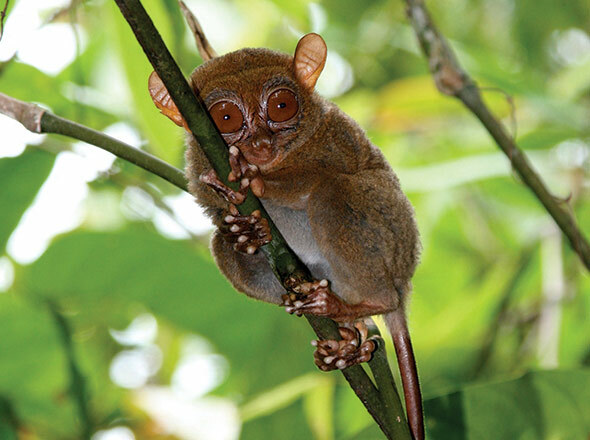 The Dinagat tarsier is found only on the small island of Dinagat and the adjacent northeast corner of the larger island of Mindanao to the south. Dinagat is dominated by mining activities, and the tarsier population there is unprotected and endangered. The tarsier's discovery and the recognition of the threats it faces are important steps toward its protection and preservation by Philippine conservationists. The study's findings appear in a paper published August 19 in the journal PLOS ONE with Dominy and Moritz among the coauthors. The new findings significantly increase the understanding of tarsier biological diversity and genetics, knowledge sorely lacking but of absolute necessity for planning successful conservation programs. "Conservation policies are only as good as the underlying science, and sound science sometimes requires teams of researchers to work collaboratively," says Dominy. "The present study is the result of years of work by Philippine and American researchers with a shared commitment to understanding the evolutionary biology of a unique and little studied primate."